When Ryosuke Takayama (Teruyuki Kagawa) was younger, he was taken under the wings of Oda, the leader of a criminal gang. Since then, Ryosuke Takayama was raised like a real son by Oda. Ryosuke Takayama then follows orders from Oda and becomes a detective. He rises through the police organization, while leaking information to Oda's gang. Following Oda's order, Ryosuke Takayama approaches Mari Suenaga (Yu Aoi), who is the daughter of a powerful politician. Meanwhile, Ryosuke begins to have disgust for his double life and wants to end his relationship with Oda. 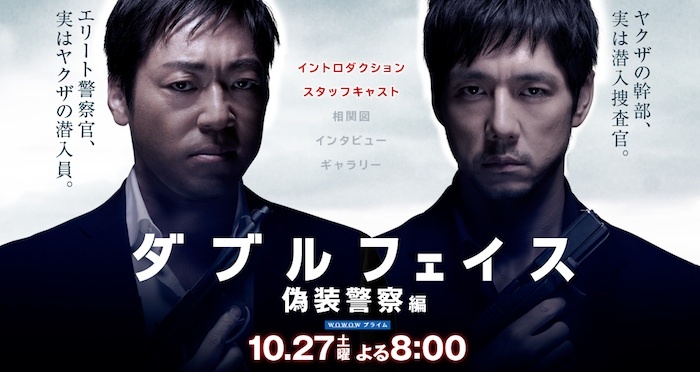 Jun Moriya (Hidetoshi Nishijima) is an undercover police officer that has long infiltrated the criminal gang led by Oda. After many clashes with the gang and police, Jun Moriya wonders where his true loyalties lie. The only person that seems to understand him is Doctor Naoko (Emi Wakui). Ryosuke Takayama then contacts to Jun Moriya, who he believes is an undercover cop. Ryosuke wants to work with Jun to get rid of his double life and start anew. The two men, with double faces, begin to fight for the meaning of their existences and their lives. Remake of Hong Kong film "Infernal Affairs". Michelle Aug 23 2012 3:15 am I going to said this the movie infernal affairs is One of my favorite movies in china but i hope they don't do it like departed because was the first remake. I hope they make a good remake and at least keep the original feel of the story intact that not change it to much.